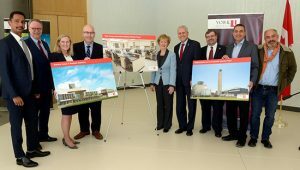 The Governments of Canada and Ontario and York University announced an infusion of $113 million in infrastructure funding that will include the modernization of labs in the Faculty of Science. Hon. Judy Sgro, MP Humber River-Black Creek, and Hon. Steven Del Duca, Minister of Transportation and MPP Vaughan attended the announcement, where Dean Ray Jayawardhana was among the speakers. IBM Canada awarded a $1.8-million in-kind gift to accelerate the Advanced Disaster, Emergency and Rapid Response Simulation (ADERSIM), a cloud-enabled platform housed at York University that enhances disaster and emergency planning through leading-edge modeling and simulation technology. Jianhong Wu and Jane Heffernan (Mathematics & Statistics) are on the ADERSIM team. Thilo Womelsdorf (Biology) was awarded an E.W.R. Steacie Memorial Fellowship by the Natural Sciences and Engineering Research Council of Canada (NSERC). Undergraduate student Armita Jalooli received a prize at a Three Minute Thesis Competition at the annual Women in Science and Engineering (WISE) National Conference. She presented research conducted with Sean Tulin (Physics & Astronomy). The Statistical Society of Canada has accredited courses in the Statics Program in the Department of Mathematics & Statistics as partially satisfying the requirements for the Associate Statistician designation. Amro Zayed (Biology) was profiled in the Brainstorm issue of yFile. Research by Professor Emeritus Hugh Wilson (Biology) on neural activity and brain waves was highlighted in yFile. Dawn Bazely (Biology) presented “Seeing the forest for the deer” at the Toronto Field Naturalists Club. Professor Emeritus Trueman MacHenry (Mathematics & Statistics) presented a talk at the Physics Meets Mathematics Conference in Havana, Cuba. The City of Toronto’s Bees of Toronto book, which was developed by Laurence Packer and Amro Zayed (Biology) and their teams, is now online. Graduate students supervised Georg Zoidl and Logan Donaldson (Biology) published new research on synapse plasticity and it was profiled by yFile. Jianhong Wu (Mathematics & Statistics) and a national team of collaborators have developed new mathematical models that will help researchers, doctors and policymakers address the challenging public health issue of antibiotic resistance in bacteria. Muhammad Yousaf (Chemistry) and his team created a scaffold-free, functional 3D cardiac tissue. He spoke to CP24, Global TV, 680 News, and CBC News about this work. Professor Emeritus Allan Carswell (Physics & Astronomy) and the LIDAR laser system he created was profiled by IEEE Spectrum. Adam Muzzin (Physics & Astronomy) and the Observatory appeared on CBC’s The National in a segment about the discovery of seven Earth-like exoplanets. Dean Ray Jayawardhana spoke with the Toronto Star about it. Paul Delaney (Physics & Astronomy) spoke to CTV News, AM900 CHML, and Newstalk 1010 about the lunar eclipse, the discovery of exoplanets and the SpaceX’s moon flight plans. Bridget Stutchbury (Biology) interviewed Margaret Atwood about bird conservation and her book Angel Catbird for Nature Canada’s “Who are the Women for Nature” series. Postdoc Heath MacMillan (Biology), Laurence Packer (Biology), Seyed Moghadas (Mathematics & Statistics), Roberto Quinlan (Biology), Bridget Stutchbury (Biology), and former PhD student Scott MacIvor were profiled in the winter 2017 issue of The York University Magazine. The Haaretz daily newspaper covered PhD student Alex Filazzola’s research on endangered lizards. Mar 8: Faculty of Science Honours & Awards Ceremony, 7-9 pm in LAS – Lecture Hall A. Registration required: http://science-awards-2017.eventbrite.ca, featuring Physics alumnus and filmmaker Ian Harnarine. Mar 10: Imposter Syndrome: Why Capable People Suffer From It and How to Thrive in Spite of It, presented by Dr. Valerie Young.